I his ground-dwelling fantail is a common, conspicuous, and tame bird, typically seen holding its spread tail at a low angle. It then pivots its body and swings the tail from side to side as it searches the ground for insects and spiders. Insects are also caught on the wing, and in quick, short runs across open ground. • NliST A cup nest made of bark, grass, spidcrwcbs, and a finer lining, situated in a tree, on a building, or on a post. 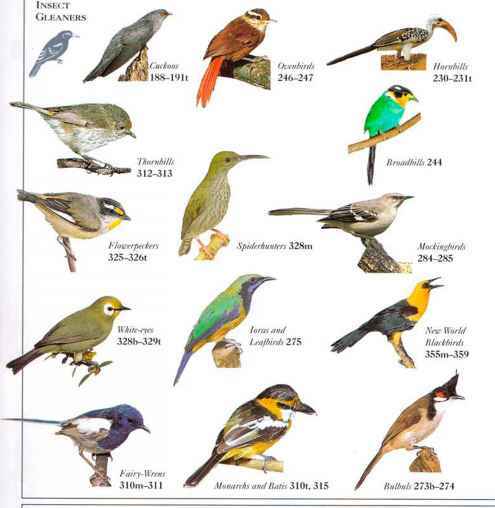 • Distribution Moiuccan islands. New Guinea. Solomon Islands, Australia. 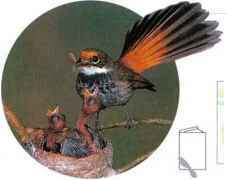 I his tree-dwelling fantail lives in the middle levels and undergrowth of rain forest and scrub. It hunts by holding its fanned tail high, tilting it and jerking it from side to side to disturb resting insects. 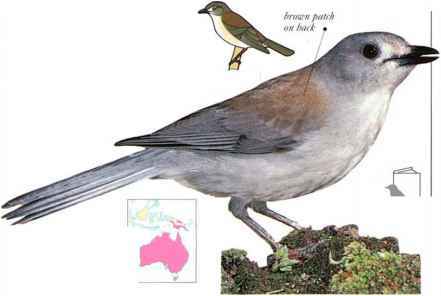 In doing this, it reveals its rufous tail and rump. • NliST A compact cup nest of grass and spidcrwcbs, with a pendant "tail," in a tree fork. New Guinea, and N. and K. Australia. A small, gray flycatcher, this species hunts from a perch, often in the cooler parts of the day, such as at dawn and dusk. It flies out to catch insects in the air or swoops to take invertebrates from the ground. Usually in pairs or small parties, the species is unobtrusive though its "jaeky-wintcr" call is easily heard. • NliST A shallow cup nest constructed of grass and rootlets, bound with spidcrwcbs, and lined with lichens. This is placed on a horizontal tree branch, often high above the ground. • DISTRIBUTION Woodland and grassland areas in Australia and S.li. New Guinea. I his bird of forest and scrubland feeds by perching on a low branch and watching for invertebrates on the ground, on which it pounces. The male advertises himself to either mate or rival w ith his scarlet breast. • NEST A cup nest made of grass and bark strips, spiderwebs, and lichens, in a hollow, on a branch, or in a fork. • DISTRIBUTION Australia. Solomon Islands, Vanuatu, I'iji. and Samoa. Small and robinlikc. 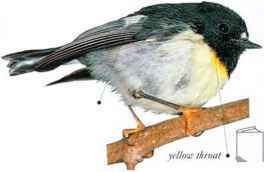 this forest-dwelling bird hunts insects on tree trunks, branches, or the ground. It is aggressive and inquisitive in its behavior, and is not shy of people. • Nest a cup nest of moss anil feathers, placed in a tree. 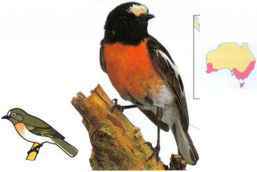 Snares Island Female distribution form is black. I his robin of forest undergrowth and scrub is so tame and inquisitive that ii is likely to approach any people who appear in its territory. It feeds mainly by pouncing from a branch or stem to seize invertebrates on the ground. 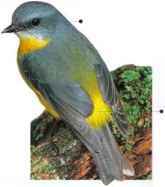 Despite its name, it is mostly gray, with yellow only on the underside and rump. • NEST A cup nest of bark and grass, bound with spiderwebs, lined w ith fine grass and leaves, placed in the fork of a sapling. • Distribution distribution E. and S.E. Australia. • REMARK The brown patch on the back is variable or absent according to geographical race. It is largest in northwestern birds. 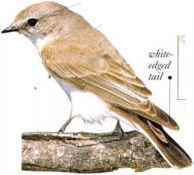 A heavy, hooked bill and active hunting methods earn the name "shrike" for this forest bird, which otherwise resembles a thrush. The species is unobtrusive but tame and is seen seeking prey in undergrowth and scrub. It feeds on invertebrates and small vertebrates, such as lizards and bird nestlings. Australia and parts of New Guinea.